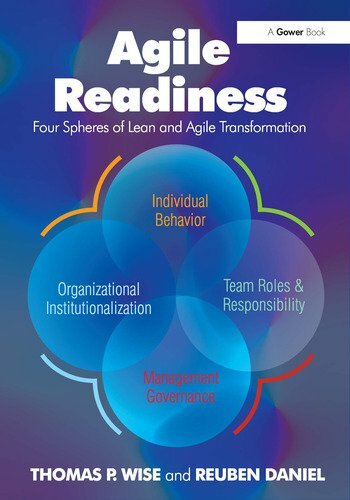 Agile Readiness is designed to provide guidance to the manager or business leader in establishing a successful environment to enable fast moving agile and lean project methods focused on business systems transformation. Agile and lean offer huge potential as methods for reducing risk and costs, delivering early benefits and ensuring IT projects genuinely deliver the business transformation benefits that they promise at the outset. The conundrum for many organizations is that without a change of organizational culture, agile and lean methods are very unlikely to be adopted successfully in traditional organizations. Thus, the struggle that many (if not most) managers and executives face is not in how agile or lean development works, but in how to make agile and lean methods successful when working beyond software development. Thomas P. Wise and Reuben Daniel provide a clear view of the struggles and remedies. Their text uses simple ground floor experiences to illustrate the practices and behaviors necessary to create highly successful and effective agile and lean business systems transformation teams. In this book the reader will discover organizational strategies that build strong teams, an environment of trust, and project selection and planning strategies to create an environment of enablement in which agile and lean teams thrive. Thomas P. Wise has an MBA and a Ph.D. in Organizational Management with a specialism in Information Technology Management. Currently he teaches Quality, Organizational Management, and IT Transformation part time as part of the Computer Sciences MSc program at Villanova University and as part of DeSales University’s Master of Computer Science and MBA programs. Reuben Daniel is a Director of Cognizant’s Business Consulting practice focusing on Business Process Transformation. With several years of experience in the Communications industry, he is an expert in Six Sigma, Lean, ITIL, Agile and Organization Change Management. Reuben has published papers on Cost of Quality, ROI and Quality Management.